Sri Lankan state & Private Universities, Campuses and Higher Education Institutes World Rankings 2017 July edition released. According to the Webometrics the 2017 Sri Lankan Universities Rankings are as follows. As January edition, Again Colombo University has come to No:1 University in Sri Lanka beating Moratuwa University. University Peradeniya has jumped to No 2 place dropping Moratuwa Campus 3rd place. Sri Jayewardene University (Japura Campus) moved to No: 4th place. Kelaniya 5th Place.Ruhuna University has dropped to 6th Place. When considering Sri Lankan Universities with World Ranking in 2014, we have improved again from 2251 place to 2146. In 2013 January ranking Sri Lankan Universities ranked 1883 place. Year 2012 Ranking Sri Lankan campus recorded 1681 place. The special feature is, 2014 University Ranking include Sri Lanka private university ranking also. 17 Private Universities & Higher Education Universities have listed here.Top 10 Private Universities in Sri Lanka. Six Sri Lankan Universities have ranked up among top 100 in South Asia, Higher Education Minister S.B.Dissanayake stated today (2014/08/19) at a meeting with University Lectures and Ministry Officials at Higher Education Ministry. According to the Minister, University of Colombo has ranked up to 24th in South Asia while it hold the 2146 in world rankings. Accordingly, University of Peradeniya and University of Moratuwa have reached up to 31 and 32 in South Asia while they are holding 2417 and 2897 in world ranking. 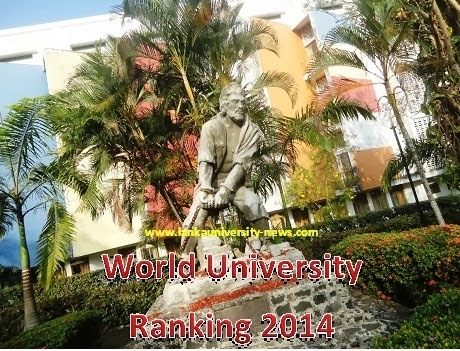 The fourth place have achieved by Sri Jayewardanepura University by holding 51 in region and 3091 in world rankings. Sri Jayewardanepura has achieved a tremendous progress when it compares to the past. Minister stressed. University of Kelaniya and Ruhuna have achieved ranks accordingly 56 and 70 in South Asia while they hold 3194 and 3483 in world rankings. Under the guidance and supervision of HE President Mahinda Rajapaksha, we have achieved a commendable development within few years as a nation among the world. According to the last statistics, we are the 2nd economic development rate holders in the world. We are only 2nd to Republic of China. This is only a milestone on the way to success in the Higher Education system but more to achieve. Our mission is to become the most cost effective higher education hub in Asia while we are developing the University System. I’m sure that we can rank- up our Universities among 100 in world rankings. It won’t take that much time to achieve that goal with the constant support of University communities. We have already completed 30 hostels for University students across the country while the 2nd phase is for 30 hostels is implementing. First phase of the hostel project of build 60 hostels will be opened by HE President soon. While providing infrastructure, we are more concerning to upgrade the academic culture as well. Minister stressed. “ලංකා යුනිවර්සිටි නිව්ස්” වෙබ් අඩවිය සමග සිටින්න. As Jaffna University students, We can't accept this ranking. see how progress of pera..
the open university of srilanka is the best ... and suuuper. If you are not selected to government university, don't worry. Now you can visit coursenet.lk to find out latest courses available in Sri Lanka. Proud for what? We don't have even one university that can be compared with top universities in the world. Shame on national leaders who ruled this country over the last few decades. And shame on all the stupid people who elected these bastards. If we need to develop SL, we need to develop the university system 1st. Please Update new rank.this is wrong one.